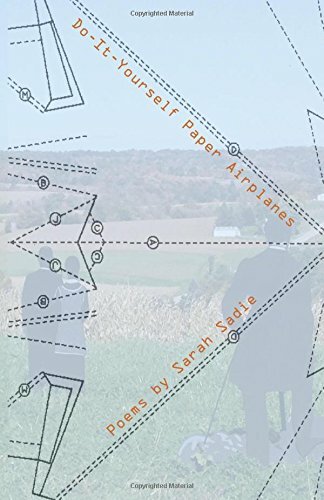 Eternal Haunted Summer: You recently released, Do-It-Yourself Paper Airplanes through Five Oaks Press. How did you come up with that title? Sarah Sadie: Well, I have always been interested in the way(s) that poetry is play, is playful. “Play for mortal stakes,” as Robert Frost put it. Airplanes made out of paper just as poems are written on paper … folding and unfolding … weight and lightness, childhood recast in adult terms … this all began to relate to poems, and particularly the poems I was writing at the time. The reader has to do some work, in reading a poem. It’s a do-it-yourself kind of thing. You get out as much as you put in, if the poem is good. Put in more effort, find and hear and experience more. That’s my hope, anyway. Poems and planes are both directed in their flight, whether or not they make it to their original destination. That was another parallel. the real text a child could understand. Why do I get confused living it through? who hear these words, take heart from me. I was once in as many drafts as you. Who touches this poem touches a woman. EHS: In your poem “I Discover Myself in the Page Before Me,” you write: “Turns out I’m palimpsest/ of trees, not blank but brimming […. ]” As a poet, you find yourself in your own writing. Have you also found yourself in others’ poems? If so, which have been the most revealing? SS: I am beginning to regret that line — so many people ask me “what is a palimpsest.” For the record, it is a surface that has been written on, then written over. A surface that contains multiple stories, texts, erasures, layers, levels … I like to think that paper itself is a rewriting of a tree, and then a poem is a rewriting of a page …. I think (I hope!) any poet has had the experience of finding themselves in the poems of others. That is one of the reasons I write poetry — out of sheer gratitude for the wavery, odd mirrors poems provide and have provided at crucial times for me. Besides the Alvarez poem above, I’m not sure I can choose just a handful of poems, but I will say that poets who have been very important for me, because many of their poems provide mirrors of different kinds: John Donne, John Keats. Emily Dickinson. Gwendolyn Brooks. Langston Hughes. Elizabeth Bishop. Robert Hayden. Sylvia Plath. Etheridge Knight. Seamus Heaney. Louise Bogan. Lorine Niedecker. Marie Ponsot. And so many, many contemporary poets right now I could not list them all and won’t even try. EHS: What do you mean by the exhortation that “we must learn to wild again”? SS: I think that statement goes hand in hand with its partner in the poem, “We must learn to world again.” To wild: to rediscover our myth-soaked, dreamy, intuitive, bloody intelligences, that we have for too long repressed, cast aside, in favor of logic, in favor of reason and rationality. Logic, reason, rationality are not bad things … but they are only part of the picture of what a human intelligence is supposed, ideally, to be. We must stitch ourselves back into the tapestries of the world. In other words, we have to pay attention!! To world again: we are making a pretty big mess of things, and doing it with more and more speed and efficiency. We need to recreate how we understand Earth, our home, how we situate ourselves. We may be able to do this in time to save ourselves from ecological disaster. I doubt it. I think we will be forced to “wild” and “world” again soon in the context of extinction and catastrophe. I have high hopes that some remnants of humanity will survive and carry on … and I hope they will have a fuller, wilder intelligence than we seem to. They, whoever they are, will be forced to world again, simply in order to survive. That’s my rather bleak vision anyway. EHS: When you are not writing poetry, you serve as co-editor with Wendy Vardaman at Cowfeather Press. Part of the Press’ mission statement is that “poetry matters.” So, big question: why does it matter? SS: Simply put, poetry remakes the world. That sounds hopelessly naive only because we no longer understand the larger work of poetry. The poem reconnects us to the larger existence. It re-situates the reader, if we allow it to. It stops time and allows us for one moment to breathe with … the stars, the people who’ve come before us, the grass under our feet, the egg that will hatch tomorrow. As well as with the spatter of gunshots that ricochet across this violence-soaked nation every day, the nattering of national media, the school buses and shopping malls and fracking operations. With all of existence. The poem is a sacred thing. Culturally, we will remember this, some day. When we need to. No — already we have the need for poetry. We will remember when we can no longer ignore that need. EHS: Congratulations on being named Poet Laureate of Madison, Wisconsin! How did you celebrate? SS: Well, here in Madison, as in many municipalities and states that have a Laureateship, it is seen as more of a service position than an honorific. So while I did have a quiet glass of champagne with my family, I was more excited to work with my co-Laureate Wendy Vardaman (we share the position, having applied and been appointed jointly) to think about how we could serve the City of Madison. We have worked to bring poetry to public spaces and places, and particularly to use our platform to invite a diverse group of poets in the City to share their words in various spaces and occasions. Our four year term will be up at the end of this calendar year. We have just started putting out the call for the next candidates. It’s been a tremendous ride, and I will be very glad to retreat once again to the quiet of my writing desk, which is my truest home.